Thank you for your interest in my work and signing up to receive my quarterly newsletter. 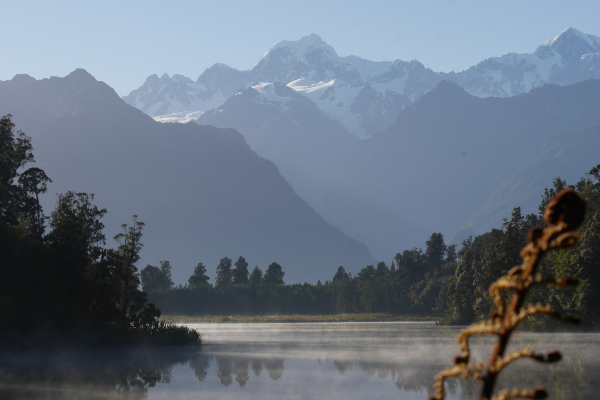 January started out with an amazing teaching trip to New Zealand. 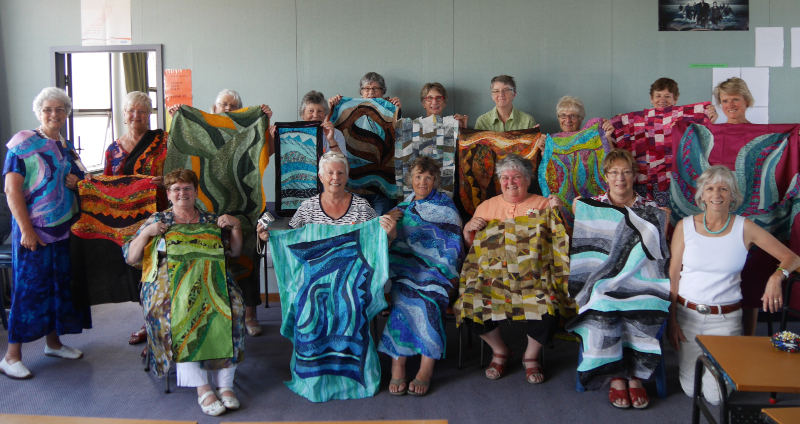 I had the honor of teaching 4 workshops at the Quilt Symposium Manawatu. The faculty list included 35 teachers (or “Tutors” as we were called) from around the world….USA, Australia, South Africa, United Kingdom and of course New Zealand. My husband was able to join me, so we took advantage of our time down under to see the sights. 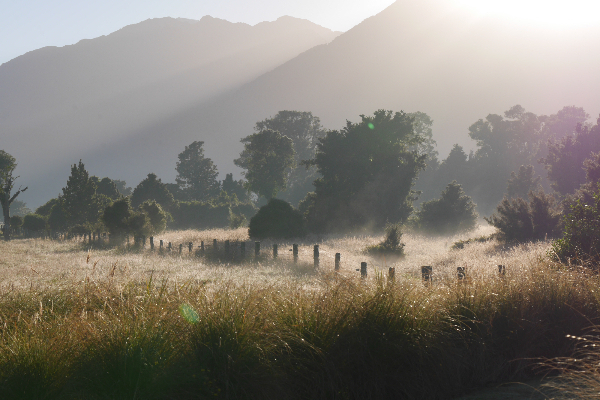 This was our second trip to New Zealand, so we were thrilled to discover places that we didn’t have time for on our first adventure. 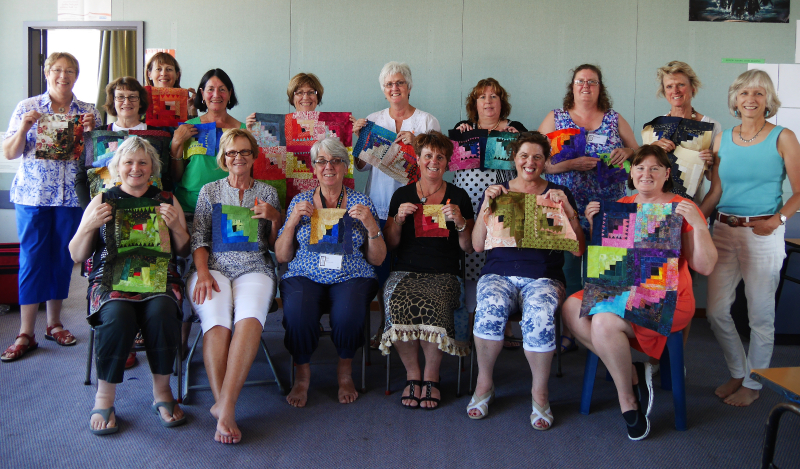 The Quilt Symposium started out with a 2 day “Let’s Make Waves” workshop. This is a technique and design workshop, which uses my layered topstitching technique to create wild curves and angles. Here are my students showing off their creations. As you can see, some students started jackets, others aimed for abstract wallhangings (and table runners) and notice that several brave students took the plunge and cut their Waves fabric into strips for impressive results. The next day we continued with waves and layered topstitching by creating a Log Cabin block with wavy topstitched logs. No blocks were allowed to be the same size. Then we added “teeth” to our blocks in the form of raw-edge triangles, which really added bite to our blocks. Take a look at the results – quite striking. Notice that many of us are in bare feet. 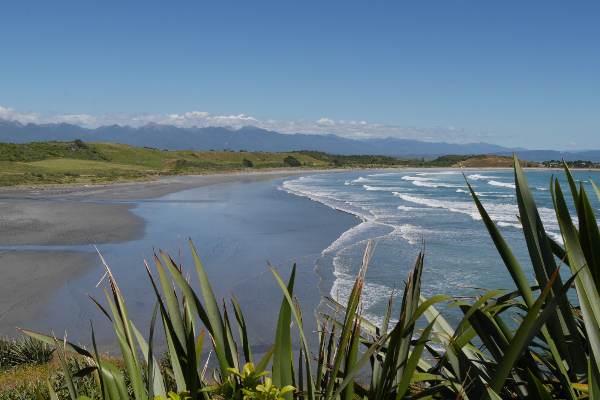 It was Summer time in New Zealand and it was HOT. 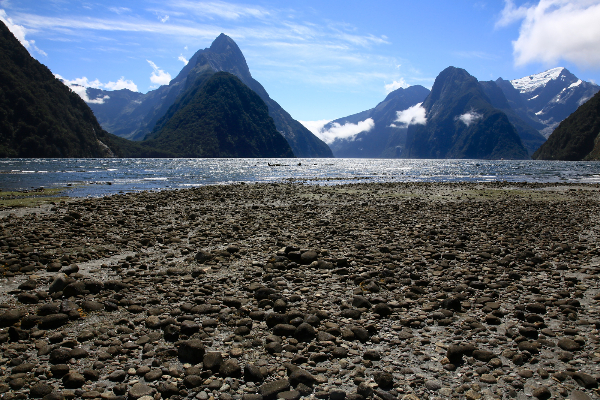 Did you know that in New Zealand it is acceptable to enter supermarkets and restaurants in bare feet? I still did a double take when I saw people in town walking barefoot, but I didn’t mind adopting the custom for teaching! 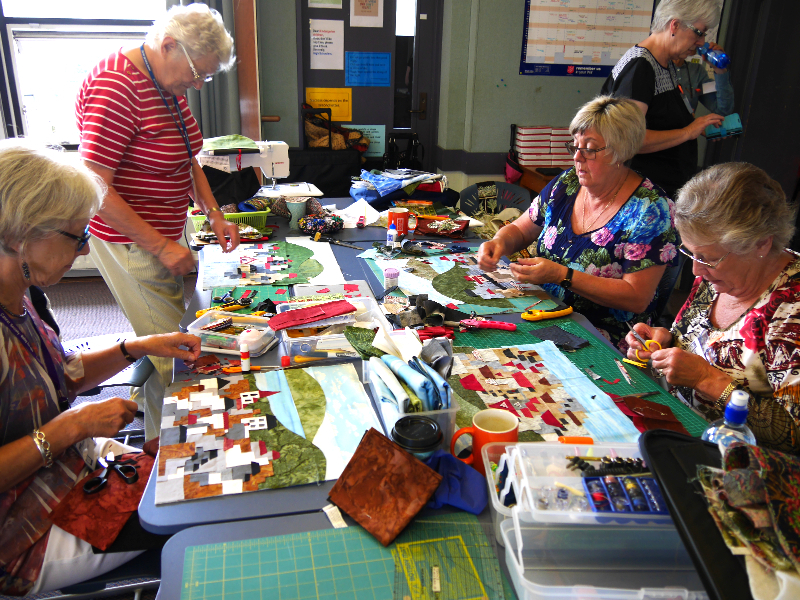 This one day workshop produced some amazing little landscapes…..accidentally! We combined gently curved strips of green (hills and meadows) with some angled strips (distant mountains) and let the scenes evolve. Every student created a success. 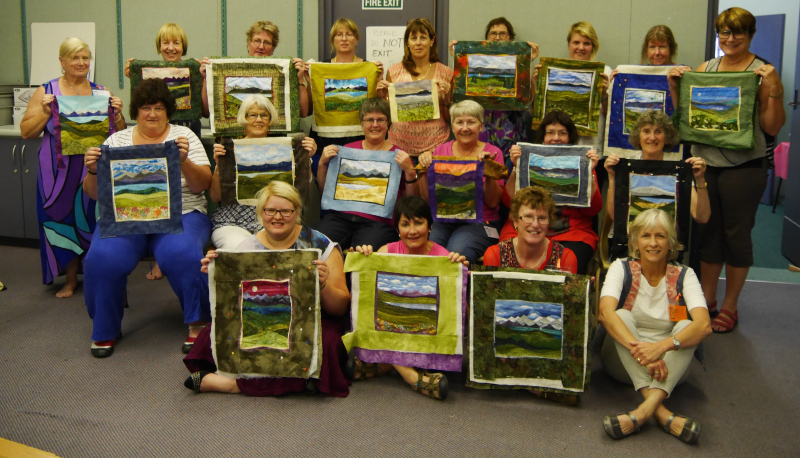 And look how many landscapes are basted and quilted in 6 hours! ….and that included time out for Morning Tea, Afternoon Tea and lunch! Everyone was proud of their creations, as well they should be. 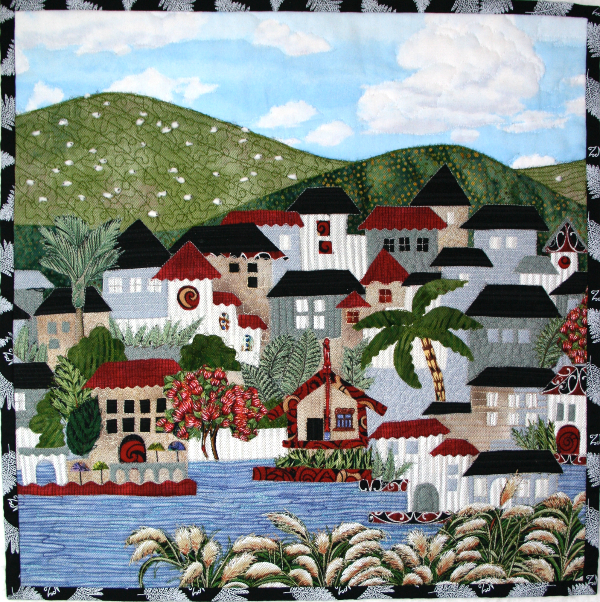 New Zealand has amazing flora and fauna AND they have it all captured in fabrics, so why not create a Happy Village using these wonderful fabrics? That’s exactly what we did. Since our projects were raw-edge fabric collage, we weren’t able to get a group shot at the end of the day, without the high risk of losing unglued buildings, windows, rooftops or trees! Here are some of my students as they begin the relaxing process of fabric collage. Below is my sample Kiwi Village. 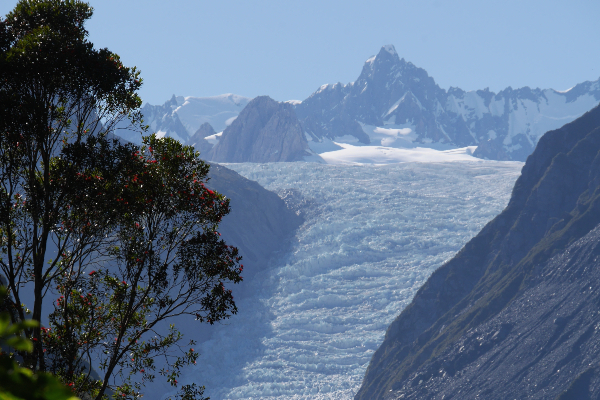 My few photos in this small space can not capture the majesty and diversity of New Zealand’s scenery, but here’s a little glimpse anyway that will take you from sandy beaches, to snow covered mountains (and glaciers) to tranquil lakes and farmland. 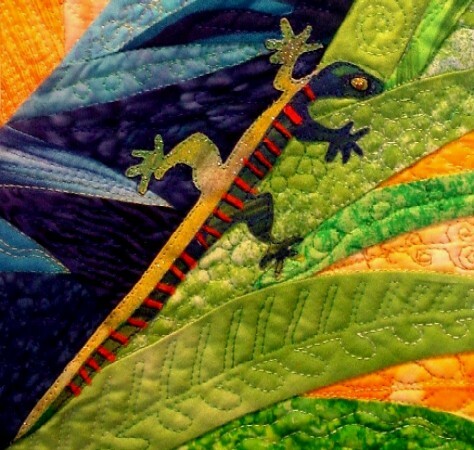 This past week I have immersed myself in the design process of a “river” quilt that I have had in my head for years. 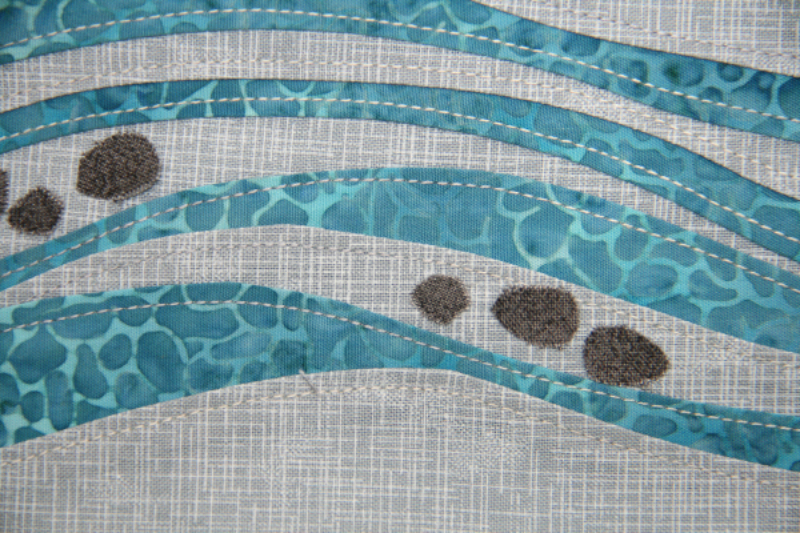 Here is a close up of the layered topstitched waves combined with raw-edge collaged fabric pebbles. I will show you more of the quilt and my progress in the Spring newsletter. 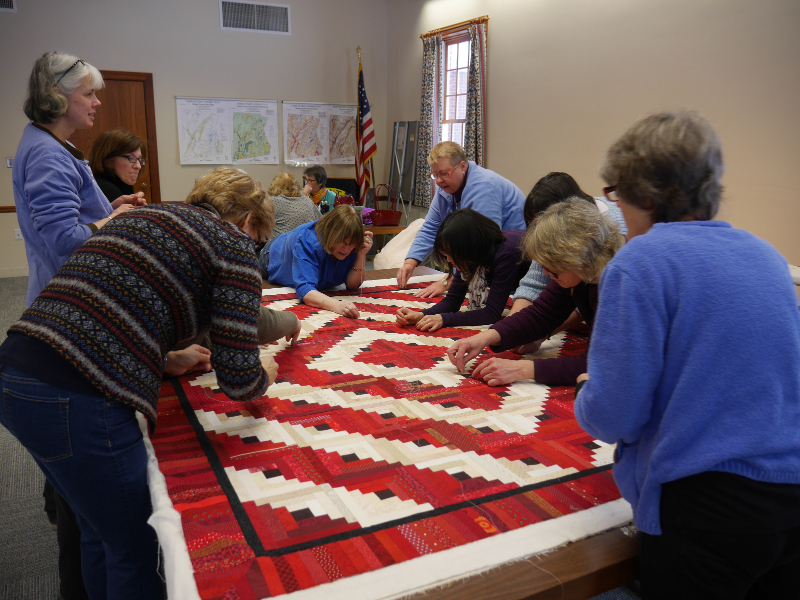 Last Fall, local resident, artisanal clothing designer and fiber artist Jane Suttell Zatlin enticed the crafters, seamstresses, quilters and even the non-sewers of Kent to join her in a Community Quilting Project to raise money for the Kent Memorial Library. About 25 of us showed up to the first meeting last Fall. Since our abilities were so varied we decided to start our first venture together with the basic traditional log cabin block. This week I will begin machine quilting our red and white beauty with some luscious King Tut cotton threads by Superior Threads (http://www.superiorthreads.com). I have found a perfect variegated red and black thread that I will use in the red logs and a subtle variegated cream for the light logs. I will be quilting this queen size quilt on my Bernina 1031 home sewing machine. It’s a big job, but “we” will get the job done (I say hopefully!). Photos of the finished quilt to follow in the next newsletter. I look forward to meeting many of you this year at workshops and re-connecting with others. In two weeks I will be driving to Virginia to teach at the Mid-Atlantic Quilt Festival. Please note that since the last newsletter, two new workshops have been added to the 2015 calendar. They are indicated by an asterisk *.